The waters of the Hood Canal are downright amazing. With breathtaking boat trips, stunning views, incredible fishing, delicious spot shrimp and world-class scuba diving, it seems hard to believe that Washington State’s Hood Canal has more to offer. Yet, it does, thanks to awesome crabbing opportunities. With both Dungeness and rock crab waiting for your pots to hit the bottom of the Hood Canal, heading out to Washington’s fjord will have you full of great experiences, fun on the water and delicious crab meat. Whether you have your own boat or need to rent one, businesses around Hood Canal have you covered with gear, great lodging, entertainment and great food. 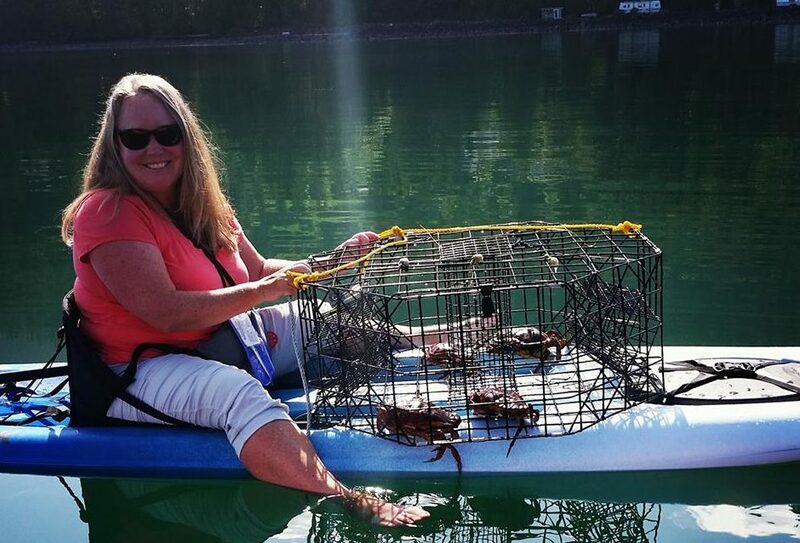 With the season ending soon, plan a crabbing adventure on Hood Canal and make it your weekend getaway. There is nothing quite like the first time you pull up a crab pot and see a crab inside of it. Pulling up the rope, the anticipation builds as you feel for heaviness on the end of the line. Is it seaweed? Is it a crab? Did an old boot somehow get into the crab pot? Hand over hand, you keeping pulling the pot up from the depths below hoping to see a tasty crustacean inside. As eagles soar overhead and seals bob in the distance, curiously watching your activities, the pot comes into view, rewarding you with a couple of crabs inside. 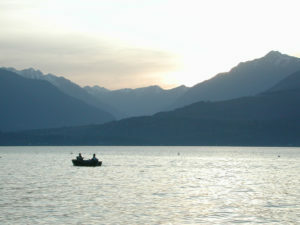 Kayak crabbing is ideal along Hood Canal because it is protected and shallow. You could paddle for five minutes and drop a pot and have success. In the summer, the weather tends to be pretty calm and the water is much warmer than Puget Sound or the Strait of Juan de Fuca, making this an ideal destination for all. Dungeness, rock and tanner crab can all be found in the Hood Canal, usually at depths between 30 and 300 feet. The tides also don’t matter as much. As long as you can get your boat out, it doesn’t matter when you head out, it just depends on the location and whether you go out on high or low tide. While you could drive to Hood Canal for the day, making a weekend out of your crabbing adventure will give you the vacation you deserve. Whether you camp and enjoy the forest, lake and mountains at Skokomish Park on Lake Cushman or stay the night right in a cabin along Hood Canal at the Waterfront at Potlatch, you’ll have an amazing time. 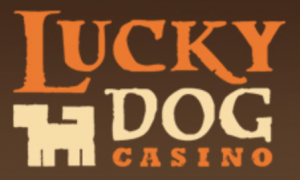 You’ll also have a chance to have a great meal and play the slots at Lucky Dog Casino, giving you both indoor and outdoor fun for your extended weekend. For those with boats, marinas can be found all along Hood Canal. Your best bet for convenience, ease, and accessibility is the Skokomish Tribe’s Boat Launch near Potlatch. This is the region’s best boat launch site. Keep in mind that the boat launch area can fill up quickly on busy summer days, so be prepared to show up early and to pay the small usage fee. Other boat launches include Twanoh State Park, the Hood Canal Marina in Union and the Rest-A-While Marina & Dive Center north of Hoodsport. For those without boats, you are also in luck. While boats can be rented from Alderbrook and Mike’s Beach Resort, we love Kayak Brinnon, as they have everything you need for an incredible day out. 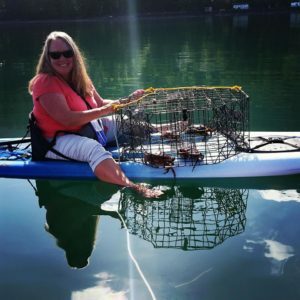 Christina Maloney, owner of Kayak Brinnon, was nice enough to give us some insight on what it’s like to go crabbing on Hood Canal, but with a twist. Kayak Brinnon has kayak crabbing equipment available, and is totally unique. You can rent crab pots that are specifically designed for kayaks. With Kayak Brinnon, all you need is a Department of Fish & Wildlife shellfish license and some bait and they hook you up with the rest of the necessary gear. Typically, Christina likes to do two soaks with kayak-sized crab pots, since the smaller pots won’t fill up with tons of crab. Depending on how near to crabs you drop your pot, you could have a crab in just a half an hour! One thing Christina strongly recommends is to bring lots of bait. Usually chicken is great, but she also has had great days out using fish heads. For those who don’t normally carry chicken or fish heads with them while exploring Hood Canal, you are in luck, as bait can be purchased at the Brinnon General Store, Cove RV Park & Store, and McKay’s Shrimp and Crab Gear. 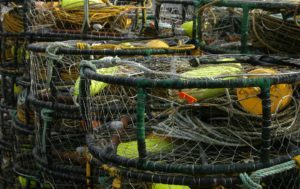 It is important to note that time is running out on this year’s short Hood Canal crabbing season. The Hood Canal recreation crab fishing season runs through September 3, 2018, with crabbing allowed only between Thursday and Monday each week. To get started on your ultimate crabbing adventure along Hood Canal, you will need to pick up a Department of Fish & Wildlife shellfish license from either their website or from many local stores all around the Puget Sound. For beginners, make sure you review this complete, step by step guide on the best ways to crab around Washington State. That way, once you are out there you can get to crabbing without worry.